The Burglar Alarm Speaker hidden spy camera has the capability of recording and viewing live video from any computer in the world via your local network or through the Internet. Included is software that makes it easy to install the camera and configure the camera for your network. This software can be configured to watch and record up to 32 cameras remotely. 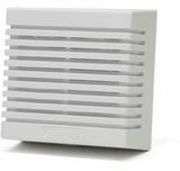 The Burglar Alarm Speaker Wireless G Internet Hidden Spy Camera connects to an Ethernet or wireless network to enable remote high-quality video recording. 802.11g wireless technology allows you to place the device in places that were previously inaccessible such as walls. Support for the WPA® and WPA2® standard ensures that you will be provided with the highest level of security when connecting to your wireless network. The Burglar Alarm Speaker Wireless G Internet Hidden Spy Camera is a versatile solution that connects to your wired or 802.11g wireless network to provide remote monitoring over the Internet. Schedule recorded video or snapshots to be uploaded to an FTP server or sent via e-mail. The SWIP-BAS adheres to the Universal Plug & Play (UPnP) specification, which allows for automatic camera detection and addition to networks. Once recognized by your network, the Burglar Alarm Speaker can be accessed and viewed from "My Network Places" as a device on your network. You can then stream the feed from the SWIP-BAS to any compatible digital media player to view from the comfort of your living room. With features such as MJPEG streaming and remote management, the Burglar Alarm Speaker Wireless G Internet Spy Camera (SWIP-BAS) is a cost-effective and versatile security solution for your home or small business. The Burglar alarm indoor speaker is none functional.